Intelligent driving that saves energy and enhances safety always means anticipating what lies ahead as well. Car-to-X communication makes a major contribution to intelligent mobility of the future by allowing the driver to look a long way ahead, see things that are hidden, and even peer around several corners. Since the potential of Car-to-X communication can only be fully exploited through mass use, the only real benefit is to be gained by researching this technology in alliance with other partners. That is why, four years ago, numerous companies from the automotive and telecoms sectors, the federal state government of Hessen, the city of Frankfurt am Main and a number of well-known universities and research institutes came together to work on the research project simTD (Safe and Intelligent Mobility - Test Field Germany). Their shared objective was to test Car-to-X technology in actual traffic. Now, the results of this project were revealed in the concluding presentation in Frankfurt am Main. Car-to-X communication: the networking technology of the future. In Car-to-X communication, vehicles and infrastructure are electronically linked to each other. This allows direct communications between vehicles as well as between vehicles and the traffic infrastructure, such as traffic light signals. Car-to-X communication takes place via wireless LAN or mobile network connections. The ad-hoc communication is based on high-speed WLAN, which is derived from the high-frequency WLAN standard IEEE 802.11p or ITS G5A and allows real-time communication. The protocol is structured so that many subscribers can communicate with each other in parallel. At the same time, mobile communication networks are becoming increasingly powerful, with higher bandwidths and even shorter delays – or latency times – in data transmission. As such, they are playing an increasingly important role in Car-to-X communication, e.g. as a means of supplementing WLAN communications. 20 BMW cars and five BMW motorcycles were involved in simTD. After four years of research, one of the world’s biggest field trials for Car-to-X communication has now been completed. Using more than 120 test vehicles, the technology was put to the test for the first time in real traffic conditions on motorways and major highways as well as urban routes in and around Frankfurt am Main. “The BMW Group was the only project partner to involve both cars and motorcycles in the field trial,” explains Dr Christoph Grote, Head of BMW Group Research and Technology. Cross Traffic Assistant and Traffic Sign Assistant developed by the BMW Group. For the simTD research project, the BMW Group engineers focused on developing two driver assistance systems based on Car-to-X communication: the Cross Traffic Assistant and the Traffic Sign Assistant. In Germany alone, a third of all accidents involving personal injury occur at intersections because other road users are registered either too late or not at all. The following is an example of an everyday situation: a driver crosses some intersections in a town or village; because of the buildings, trees and cars parked along the roadside, the view of the intersecting roads is often impeded. Sometimes crossing traffic has priority, and usually (in Germany) vehicles from the right have precedence over those from the left. It is at this point that the Cross Traffic Assistant intervenes: on the basis of received data concerning road users in the area of the intersection, it is able to give the driver advance warning of any possible hazards. “The system evaluates all incoming data, such as the speed, distance from the intersection and direction of travel of other road users, along with information generated by the driver’s own vehicle. If the driver does not react to an intersecting vehicle, he will be warned by visual as well as acoustic signals,” explains Grote. This means the driver can brake in time and avoid an accident. The system thus effectively pre-empts any failure to see crossing vehicles that have right of way. The experts from the BMW Group and the participating simTD research institutes assessed the active system on the basis of numerous reconstructed accidents, driving simulation experiments and test drives at the simTD proving grounds with vehicles from all manufacturers involved in the project. This included analysing approximately 4,000 crossings of intersections. “The investigations proved that, with the current close-to-production positioning technology, the Cross Traffic Assistant function already has the potential to prevent many accidents at intersections,” says Grote. By means of Car-to-X communication, the Traffic Sign Assistant also informs the driver very early of varying traffic management signs relating to road and traffic situations, such as current speed limits or congestion warnings. Due to this foresight further efficiency functions could be implemented. As soon as vehicles are thus alerted by Car-to-X to the relevant traffic signs and lanes, further valuable functions become possible. Traffic light systems, for example, can transmit information on their phasing so that a driver assistance system can either indicate the optimum speed to catch a succession of lights on green or warn of the risk of crossing the lights at red (Traffic Light Phase Assistant). By transferring specific data on traffic levels, the state of road surfaces and other factors, a vehicle is able to issue advance warnings of accidents (obstacle warning), traffic tailbacks (end of tailback warning) or black ice (road weather warning) to other road users in the vicinity. Further Car-to-X functions in the simTD research project include warnings of emergency vehicles and the electronic brake light, which alerts the driver to sudden braking by vehicles ahead. BMW ConnectedRide. Active protection also for motorcyclists. The BMW Group always takes account of all road user target groups in its aim to raise road safety standards. As well as applications for BMW Group cars and for the protections of pedestrians and cyclists, integrating motorcycles into the bidirectional networking system is also a particularly important aspect of Car-to-X communication. 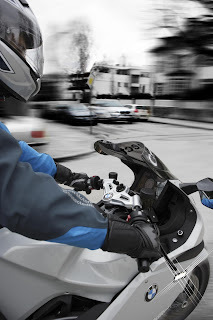 BMW Motorrad ConnectedRide is the two-wheeled counterpart to BMW ConnectedDrive and focuses on enhancing safety for motorcyclists. A key element of the project here was the development of rider assistance systems based on Car-to-X communication. Out on the road motorcyclists face other dangers than motorists do. Certain situations, such as fog, slippery roads or heavy rain, pose far more of a challenge to motorcyclists than to car drivers. And due to their slim silhouette, bikers unfortunately are frequently overlooked. It can therefore be of great benefit to motorcyclists if they and the car drivers sharing the road are made aware of each other’s presence in good time. simTD is a joint project between leading German carmakers, car suppliers, telecommunications companies and research institutes. The project partners are: Adam Opel AG, AUDI AG, BMW AG - BMW Forschung und Technik GmbH, Daimler AG, Ford Research Centre Aachen, Volkswagen AG, Robert Bosch GmbH, Continental Teves AG & Co. oHG, Deutsche Telekom AG, Fraunhofer Society for the Advancement of Applied Research, German Research Centre for Artificial Intelligence (DFKI), Technical University of Berlin, Technical University of Munich, Saarland University of Applied Sciences, University of Würzburg, Hessen Mobile – Road & Traffic Management, city of Frankfurt am Main. The project was funded and supported by the Federal Ministry of Economics and Technology (BMWi), the Federal Ministry of Education and Research (BMBF) and the Federal Ministry for Transport, Building and Urban Development (BMVBS) as well as the state of Hessen, the German Association of the Automotive Industry (VDA) and the Car 2 Car Communication Consortium. Further information can be found at http://www.simTD.de. The BMW Group is one of the most successful manufacturers of automobiles and motorcycles in the world with its BMW, MINI and Rolls-Royce brands. As a global company, the BMW Group operates 29 production and assembly facilities in 14 countries and has a global sales network in more than 140 countries. In 2012, the BMW Group sold about 1.85 million cars and more than 117,000 motorcycles worldwide. The profit before tax for the financial year 2011 was euro 7.38 billion on revenues amounting to euro 68.82 billion. At 31 December 2011, the BMW Group had a workforce of approximately 100,000 employees.